[A Victorian romance continuing family stories begun in the various Regency books of Jude Knight and Mariana Gabrielle.] David "Toad" Northope, heir to the Duke of Wellbridge and rogue in the mold of his infamous father, knows Lady Sarah "Sal" Grenford, daughter of the once-profligate Duke of Haverford, will always hold his heart. But when the two teens are caught in bed together by their horrified parents, he is sent away to finish school on the Continent, and she is thrown into the depths of her first London Season. Can two reformed rakes keep their children from making the same mistakes they did? The dukes decide keeping them apart will do the trick, so as the children reach their majority, Toad is put to work at sea, learning to manage his mother's shipping concern, and Sal is taken to the other side of the world, as far from him as possible. 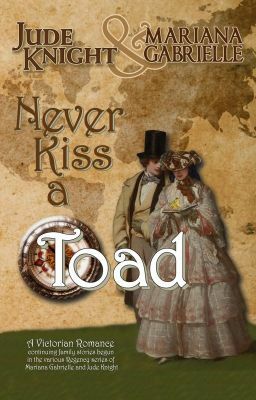 How will Toad and Sal's love withstand long years of separation, not to mention nasty lies, vicious rumors, attractive other suitors, and well-meaning parents who threaten to destroy their future before it has begun?